Medicare is an essential program that currently provides healthcare benefits to 58 million Americans. Spending on the program is growing rapidly, which could threaten the ability to provide services in the future, according to the most recent annual report from the Medicare Trustees. Medicare has a fundamental imbalance between spending and revenues. In coming years, as revenues flowing into the program are insufficient to finance promised benefits, health programs critical to millions of Americans could be affected. The Medicare Hospital Insurance Trust Fund will be depleted in 2026, which is three years sooner than was projected in last year’s Trustees report. The key drivers of financial concerns surrounding Medicare are fundamental and predictable factors—in particular, a rapid increase in healthcare costs and an aging population. Rapidly Rising Spending: Medicare spending equaled 3.7 percent of gross domestic product (GDP) in 2017, but is expected to rise to 5.9 percent of GDP by 2042 — a 60 percent increase. Those amounts include spending on hospital coverage, medical services and prescription drugs. 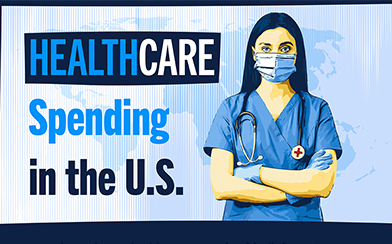 Because of the rapid growth in spending, Medicare will represent an increasing proportion of the federal budget going forward. The program will account for 21 percent of federal spending by 2042, up from just 3 percent in 1970. Demographics: With more Americans reaching retirement age – and living longer in retirement – the aging of the population is a major contributor to Medicare’s financial challenges. As the baby boom generation reaches retirement age, enrollment in Medicare has begun to grow rapidly. In 1990, there were 32 million people age 65 and older. Today, there are 51 million people, a 60 percent increase. And by 2048, the Trustees project that the number of Americans age 65 and over will increase by another 60 percent to 84 million people. Another illustration of Medicare’s demographic challenge is the declining ratio of workers to beneficiaries. In 1970, there were 4.6 workers contributing payroll taxes for every individual receiving benefits. Now, that ratio has decreased to 3.0 workers for every beneficiary in 2018, and is projected to fall to 2.3 workers for every beneficiary in just 15 years. That will have a significant impact on the solvency of the program. What does this mean for Medicare beneficiaries? The Trustees warn that Medicare’s unsustainable future threatens benefits that millions of Americans – including retirees and people with disabilities – are counting on under the program. Medicare’s largest component – known as Part A – covers inpatient hospital visits and care at skilled nursing facilities. It is funded via the Hospital Insurance (HI) trust fund. The HI Trust Fund is now projected to become depleted in 2026, which is three years earlier than predicted in last year’s report. Without action, this will result in a 9% cut in payments to providers under HI in just 8 years, affecting 73 million enrollees. The HI trust fund’s challenges are exacerbated over the long run, putting the vulnerable populations that rely on Medicare at risk of losing the critical healthcare services provided by the program. Although both income and expenditures are near 3.4 percent of taxable payroll in 2018, spending is projected to rise to 4.7 percent by 2035, while income would grow to only 3.7 percent, which leaves a deficit of 1 percentage point of taxable payroll. The annual deficit would remain around 1 percent of taxable payroll for much of the 75-year projection period, which will deplete the trust fund in just eight years. The Trustees also report on the status of the Supplementary Medical Insurance (SMI) trust fund, which finances Medicare Part B and Part D, and includes coverage for medical services (including outpatient hospital treatment, ambulance services, and medical equipment) and prescription drugs. The SMI fund covers about one-quarter of its costs through premiums charged to beneficiaries. By design, transfers from the General Fund of the U.S. Treasury cover the rest of its costs. As a result, the SMI trust fund is not threatened with depletion. However, programs funded through the SMI fund are still the source of fiscal challenges and budgetary pressure. As the Trustees point out, SMI expenditures are expected to grow significantly throughout the projection period. Read more about the Medicare program and how it works. Long-term demographic trends are clear and their fiscal consequences are well known. The good news is that many policy solutions are available to address this predictable challenge and improve the financial outlook of Medicare. The Congressional Budget Office published a compendium of options to reduce the deficit, including several that would address the Medicare program. In addition, the Medicare Payment Advisory Commission identified areas where eliminating or reducing unnecessary payments and subsidies could reduce costs without significantly harming access or quality. The 2018 Trustees report has made it clear that Medicare continues to face a grim financial future. Medicare is an essential program that is relied upon by millions of older Americans. Policymakers should work together to come up with bipartisan solutions to address Medicare’s financial issues.